Rhenium-188 is a beta-emitter with a 16.98-hour half-life, it may form complexes. It allows synthesizing radiopharmaceuticals for diagnostics and therapy of malignant tumors, bone metastases, rheumatoid arthritis and other diseases. The parent isotope is Tungsten-188. The advantage of this generator is the presence of both beta- and gamma- radiation components (0.155 MeV); the first of these ensures a high therapeutic effect and the second one enables the operators to receive visual information in conventional gamma-cameras. Manufacturing enterprise: SSC RF-IPPE, FSUE. Parent isotope's activity: 3,7; 5,5; 7,4; 18,5; 37,0 GBq. Generator's weight: 16 kg (without package). Lifetime: 40, 80, 110, 150, 200 days (depending on the generator's type). Short half-life period of Re-188 (17 hours) makes it safer for patients, staff and environment. The presence of mean energy β-emission provides an optimal therapeutic dose for affecting pathology focus (tumors and other). The presence of a γ-component with the energy of 155 keV in the emission spectrum makes it possible to monitor the behavior of the labeled pharmaceutical in the patient's body using SPECT. Produced in accordance with the requirements of the Radiation Safety Standards-2009/2010. The half-life period of parent W-188 radionuclide (69,4 days) makes it possible to use one generator for 6 to 12 months (depending on the generator rated activity). 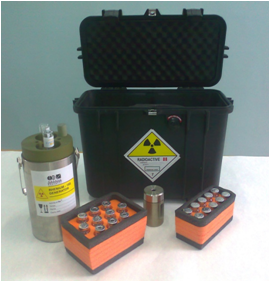 Rhenium-188 generator is designed for multiple production of sterile, pyrogen-free sodium perrhenate solution with Re-188 radionuclide (elute) which is used to manufacture radiopharmaceuticals using special kits. The radiopharmaceuticals so produced are applied in medicine for therapeutic purposes.